Hope's Cafe: Hamadi Beauty Review and Giveaway!! 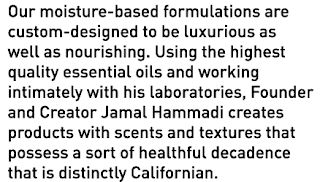 Hamadi Beauty was founded by Jamal Hamadi, and offers organic hair and beauty care products. The perfect gift for any woman! I was sent the Ginger Soymilk Hair Wash, Shea Rice Milk Conditioner, and some trial packets of Shea Leave-In. The Hair Wash is made with Ginger, Sweet Orange and Rosewood. It has a lovely exotic fragrance, with citrus being the strongest scent. I really liked this hair wash, as it really left my hair feeling clean...really clean! It takes a little more of the shampoo to lather up for my long hair, but that's no big deal when it provides such great results! 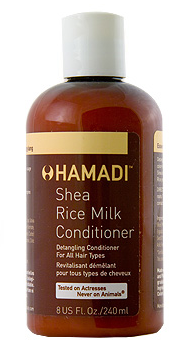 The Shea Rice Milk Conditioner is a nice, detangling conditioner made with Clary Sage and Ylang Ylang. It also has an exotic fragrance, and leaves my hair smelling very nice! I have to say, I was surprised with how manageable my hair was after using this. Usually if a conditioner doesn't leave my hair smooth and silky during rinsing, it means my hair will be frizzy, dry and hard to style when I get out of the shower. So, when I used this and I couldn't really feel that silky touch, I was a little worried. But, when I got out and towel-dried my hair, it brushed out sooo easy! I couldn't believe it! I had no frizz, no trouble trying to style my hair...it was soft and silky! I'm guessing what that means is the other conditioner I'm used to leaves junk in my hair, and that's why it feels so different while rinsing. 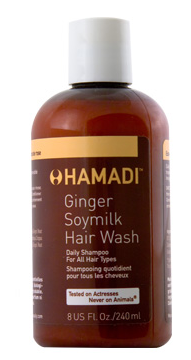 Hamadi leaves my hair soft and clean, not weighted down with chemicals and junk! I also fell in love with the Shea Leave-In. This is a great conditioning and styling cream that moisturizes, adds shine, and locks in moisture! As an added bonus, both the conditioner and leave-in have a naturally occurring sunscreen (in the shea butter), so it protects your hair from harmful rays, too! Hamadi is giving an Eco-Pac to one of my readers! This pack includes a 2 oz. Hair Wash, Conditioner, Healing Serum and a Lip Balm! Go to Hamadi Beauty and tell me another product you'd like to try! Disclaimer:I received product for the purpose of review. All thoughts and opinions are mine. All quotes taken from the Hamadi Beauty website. I'd love to try the lemon mint hair wash. I entered your Ozone Socks giveaway. I would like to try the Healing Serum. Please enter me. Thanks! I like tne natural hair brush. I'd love to try the Shea Spray; I have horrible issues with frizz when I blowdry. Hi, I'd like to try the Shea Hair Cream. Thanks for the great giveaway! would love to try their shea Hair Mask. entered Cowgirl Justice Hoodie giveaway. I'd like to try the lemon mint hair wash. I entered the custom creation giveaway.